Located in the western most region on Honshu, the main island of Japan, is Hiroshima, a modern city with abundant culture and history. Located in Hiroshima Bay is the small island of Miyajima, one of the most scenic sites in Japan! 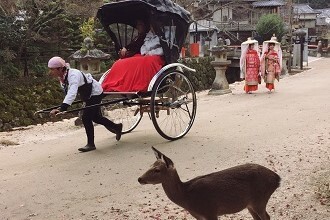 Miyajima is accessible by ferry and when you first arrive, you’ll be welcomed by wandering deer. Just around the corner from the ferry port is the UNESCO World Heritage Site Itsukushima Shrine. Part of the Shrine is the massive red torii, or gate, that is seen floating in the water during high tide and by low tide visitors can walk straight up to it. A common light-hearted rivalry among people in Japan is which okonomiyaki is better – Kansai style or Hiroshima style. You may be thinking – what is okonomiyaki? This popular dish is most like a savory pancake containing a variety of ingredients such as shredded cabbage, pork or seafood, noodles, and then topped with a fried egg and generous amount of sauce. You’ll just have to see for yourself which style you prefer! For the perfect mixture of history, culture, and modern – Hiroshima is the place to go! For more information about schools in AEON’s Seibu area click here.